WATCH: Did Bobby Flay Sneak His Team A Recipe On Food Network Star? On this week’s episode of Food Network Star, cheftestants were forced to cook for food court patrons at the South Street Seaport. 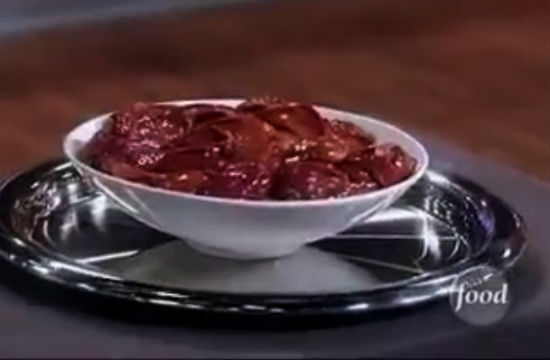 Everything was going swimmingly until Next Iron Chef winner Geoffrey Zakarian popped up with a less-than-friendly-for-the-unsophisticated-palate mystery ingredient which each team had to incorporate into one of their dishes: chicken livers. Now, Team Giada, who was cooking Mexican cuisine, stepped up to the plate and Yvan offered to work chicken livers into his carne asada tacos, just like Mom used to do. Team Alton’s Rebel With a Culinary Cause, Justin, jumped at the chance to throw chicken livers into his fritto misto for their Italian-themed cuisine. But Team Bobby kind of just stared blankly while B-Flay handed them a recipe out of his own repertoire. Apparently, this isn’t against the rules for mentors to do, but we still think it was kind of a cop out for Team Bobby. Regardless of how well executed Michelle‘s chicken liver crostini dropped into a bowl of clam chowder was, she dreaded the idea of working with it, and basically just did what Bobby told her to do. We know Top Chef-testants cook each other’s recipes all the time (more likely than not resulting in someone being thrown under the bus come judges’ table), but it’s not like “mentor” Tom Colicchio is tossing flailing chefs his best pork belly dish. Check out the clip below and tell us if you think Bobby’s move gave his team an unfair advantage.